Amidst record numbers of store closings, can you name three retailers (other than Amazon) that are likely to have plenty of inventory and traffic this holiday season? Our surveillance turned up three brands that look ripe for ripping off: Sephora, Home Depot and Best Buy, all of whom competed in categories that showed above-average growth during Holiday 2016. Wait, wait, wait. We’re not suggesting you swipe these retailers’ inventory — just a few of their ideas. Here’s a rundown of their latest winning strategies. The Restock Now option in its mobile app, which shows everything you’ve bought in the past through any of its channels, including any free samples you’ve received. The Virtual Artist experience, which lets you try on thousands of lipsticks and eyeshadows in the privacy of your home. It uses the latest augmented reality technology to precisely map your facial features, and the 3D live view moves along with you like a mirror. In-store services that you can explore and book online, including makeovers, tutorials and special events featuring beauty artists from top brands. Results: Double-digit growth in both revenue and profits in 2016, plus market share gains. In the 2016 Digital IQ Index study, Home Depot was one of only two big box retailers to earn the top-level “Genius” rating. The chain was praised for, among other things, its shoppable social feeds and a robust mobile app that shows store-level inventory levels, helps shoppers locate a specific item in the store and offers multiple fulfillment options. As part of its Buy Online Deliver From Store initiative, Home Depot now calculates earliest-possible delivery timing on a case by case basis, rather than giving a generic estimate. This “dynamic ETA” is faster and more accurately estimated. The retailer makes sophisticated use of customer data for media strategy. As a simple example, when planning a retargeting or cross-selling campaign, it would research, not assume, timing: After a customer buys product A, will they buy product B within 45 minutes or 25 days? Its holiday decorating assortment has grown five times since the category launched 10 years ago. The chain sells millions of poinsettias and Christmas trees as well as a variety of lighting and decorating products, feeding consumers’ desire to do something different from last year (or different from their neighbors). Results: Q4’16 sales up 6% vs. the prior year, with 5% growth projected for 2017. Its Geek Squad tech support unit for both in-home and online service, with 24/7 availability, fills the growing gap between what technology can do and how much time consumers can devote to figuring it out. It also puts Best Buy staff in a great position to learn more about their customers. The Ignite page on its website gives customers the opportunity to learn about and buy innovative new products from startups. Getting an early read on customer reaction to leading-edge products is another way Best Buy both creates unique value for its customers and captures another type of customer insight. Its curated gift center, which makes it easy to find a gift by occasion, demographic, price point and availability for same-day store pick up, but also helps Best Buy differentiate purchasing for one’s self from purchasing for others. A well-integrated store, web and app experience. Best Buy’s mobile web user experience scored 90.3 out of 100 in a 2017 test that evaluated ease of use, speed, credibility, aesthetics and delight; Home Depot scored 89.5, while Walmart scored just 72.5. Results: 2016 net earnings of $1.2 billion, up 37% over the prior year. Through April 2017, Best Buy’s quarterly earnings per share have exceeded Wall Street expectations for 14 quarters in a row and the brand has had more than 10 years of consecutive dividend increases. To wrap it all up with a bow, here are three things they share. They all collect and use customer data extensively across the enterprise to improve the customer experience. Example: Best Buy’s strategic creation of experiences that both delight customers and capture data that improves its CRM capabilities. All three brands support both customers and store associates with well-designed tech tools that eliminate points of friction in the shopping process, from product finding to fulfillment. Example: Home Depot’s mobile app provides several levels of assurance that you’ll get the product you need when you need it. They have all taken their brand beyond just being a great seller of products to being a provider of experiences that forge emotional connections between brand and customer. The brand becomes a trusted source of education, inspiration, even entertainment. 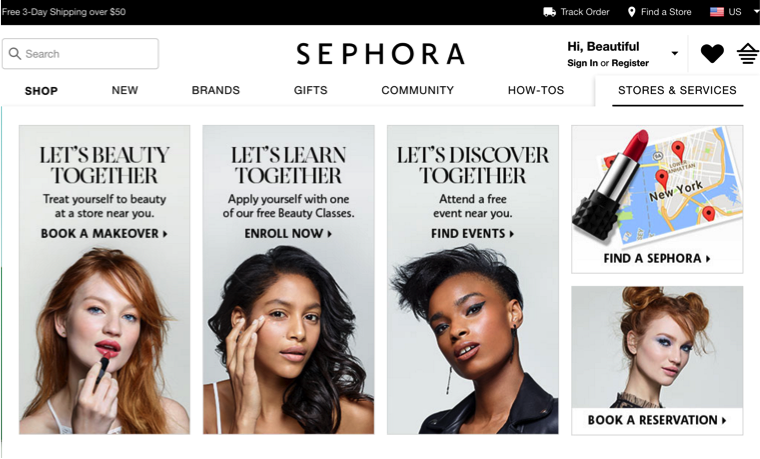 Example: Sephora’s virtual and in-store experiences. All three retailers are poised for big things this holiday season. Rip them off (or, to put it another way, reapply their bright ideas) to boost your own success during Holiday 2017.